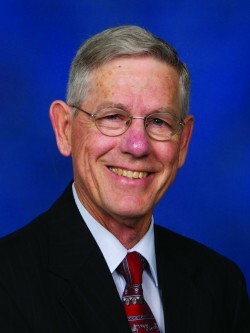 MILLIGAN COLLEGE, TN (Oct. 10, 2013) — Dr. David Eubanks, president emeritus of Johnson University in Knoxville, Tenn., will speak in chapel at Milligan College on Thursday, Oct. 17, at 11 a.m. in the Mary B. Martin Auditorium of Seeger Memorial Chapel. Eubanks served as president of Johnson University for 38 years. He retired in 2007 and continued to serve as president emeritus. In 2013, he came out of retirement to help guide the process of Johnson’s merger with Florida Christian College (Kissimmee, Fla.) and began the new chapter of Johnson University Florida as its chief operating officer. Eubanks has served as officer and board member of several national educational and church association agencies. He has traveled and spoken worldwide, serving and encouraging missionaries, churches and alumni of Johnson University. His writings include numerous historical, biblical and devotional articles, as well as a Bible study on the book of Hebrews. To learn more about spiritual formation events at Milligan, contact Campus Minister Brad Wallace at 423.461.8748. To learn more about Milligan, visit www.milligan.edu. Posted by tommy on October 10, 2013.